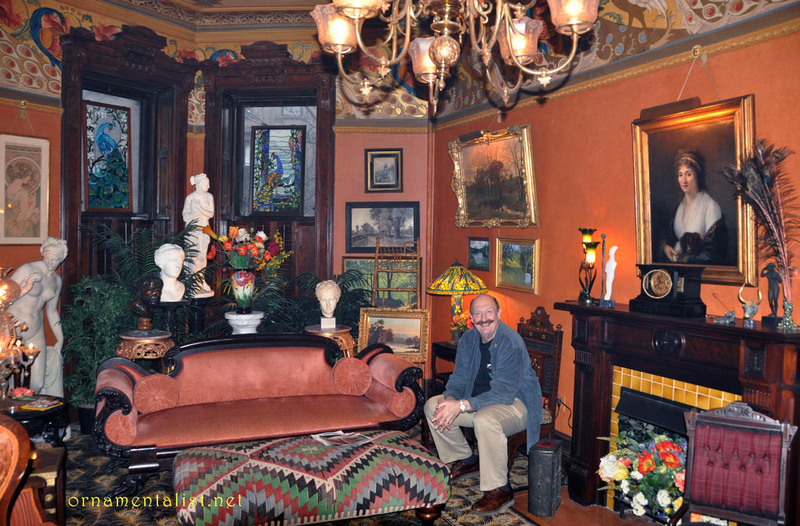 During our recent visit to New York, the maestro and I made a trip out to Brooklyn, to visit Mr. Clem Labine at his historic Park Slope brownstone. Portrait of the Publisher as a Young Aesthete. 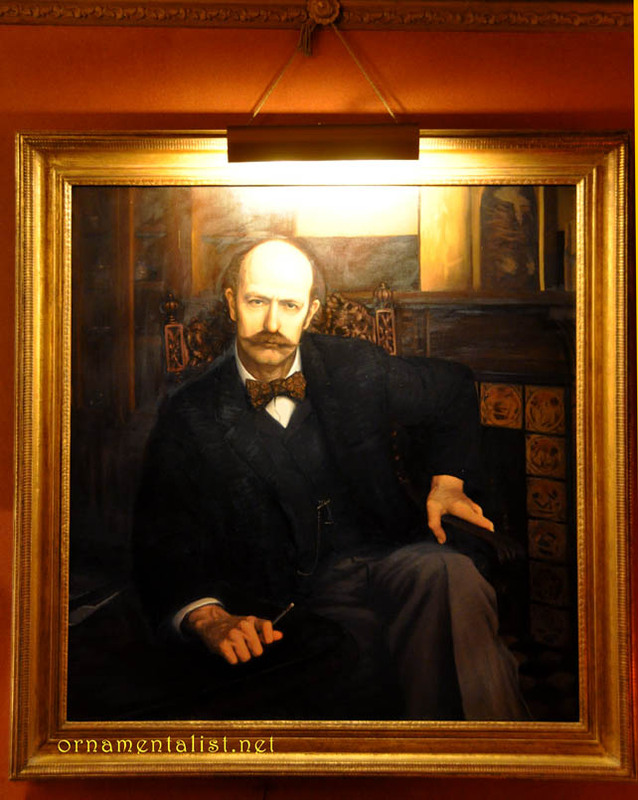 Mr. Labine is the notorious founder and former editor and publisher of the Old House Journal, Traditional Building, and Period Homes magazines, all of which sprang from his passion for preserving and improving older buildings, starting with his own spectacular manse. It's no surprise that his home boasts outstanding original as well as restored features and is decorated in high Victoriana, complete with koi pond and neoclassical statues. Clem is also a longtime Friend of Artistic License. My favorite room is the Peacock Parlor, the formal sitting room on the grand main floor of the house, with its massive original casings and doors, high ceilings, coral walls, and crammed with art and statues. On the day we visited, an indoor bocce court (non-regulation) had been constructed on the spacious peacock feather patterned carpet. But the real story for The Ornamentalist here is the custom-painted frieze. 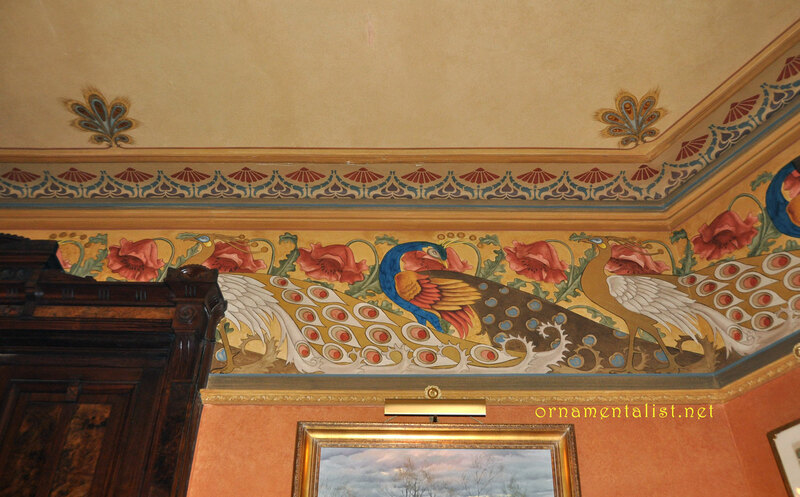 Unusually large at about two and a half feet high, the Peacock Frieze was designed and painted ~ 30 years ago by Austrian-trained Helmut Bucherl, ably assisted by Howard ("Howie the Grainer") Zucker, the son of a German-born decorative painter. 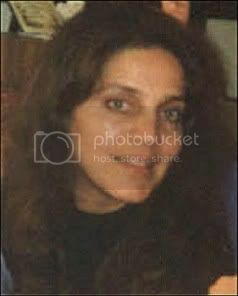 Both artisans spent most of their professional life working for Rambusch Painting Studios of New York. The inspiration for the design was found in an old Dover Edition and embellished by Mr. Bucherl, whose Austrian roots show in the Secessionist-style elements. The ceiling has a very cool anthemion detail of stylized peacock feathers. 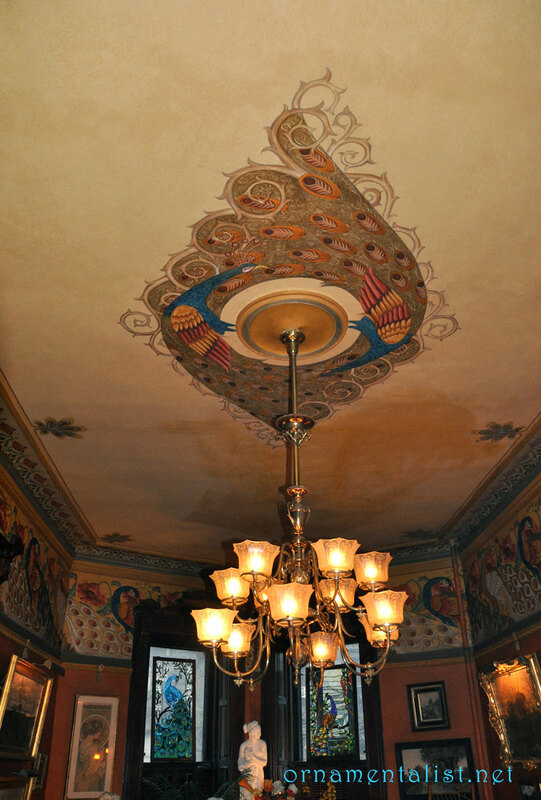 These borders were painted using a combination of stencils, pounces, hand-shading, and gold leaf, and the entire room, including the ceiling, has been glazed. While the color are rather intense, in the intimate light of this room, they look perfectly balanced. 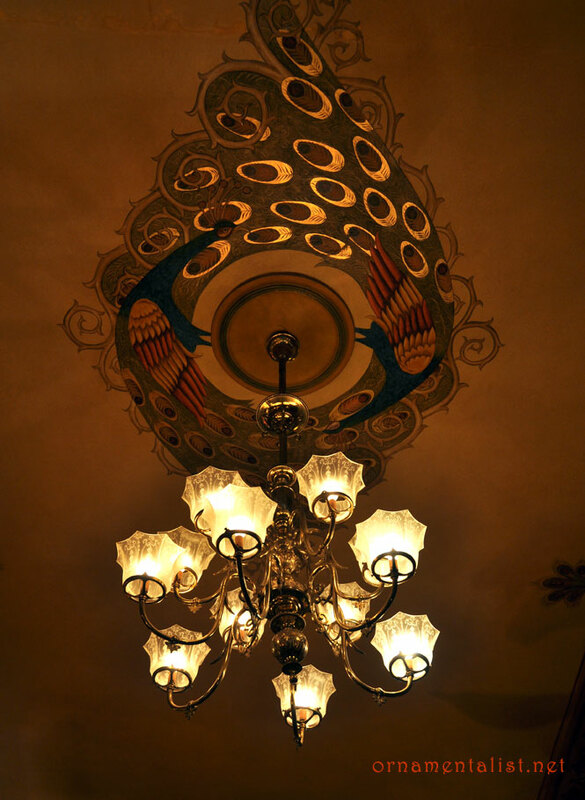 The peacock motif was adapted to create a four by eight foot ceiling rosette with a fabulous antler-branch spiral border and gold leaf accents which glitter above the electrified gas chandelier. 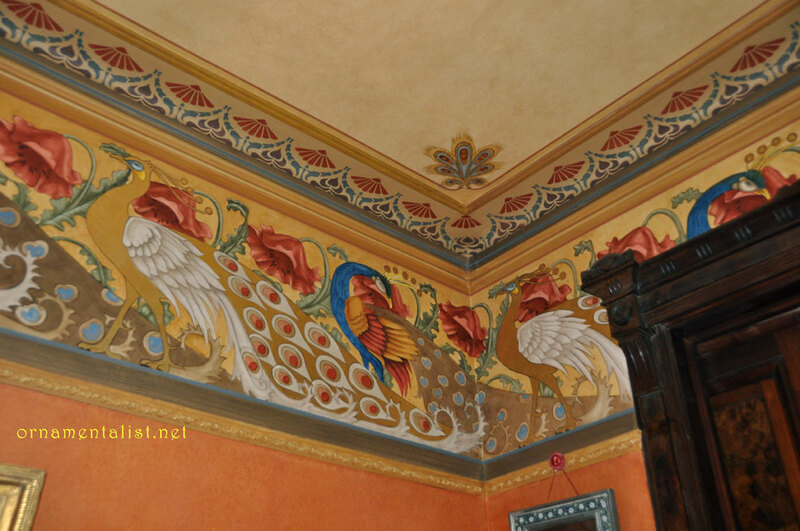 As you can see a gorgeous decorative painting job endures, like great architecture. anthemion is in the glossary! Love the story Lynne! and you know I love peacocks too... this is some beautiful work, thanks for sharing! LOVE reading your behind-the-scenes, historical posts. This was a beauty. I audibly gasped at the detail and vibrancy of these ornamental paintings. I can not imagine pulling something like that off - what a talent! Thank you for sharing - love your site. That is stunning! I especially love the ceiling but just thinking about the repetition in the work on the individual peacocks in the frieze is mindboggling. Thanks for sharing. This is truly a work of Art, done by my brother Helmut Buecherl! He loved his work and I'm sorry to say he passed away in August 2016. I'm so glad he left a legacy. Thanks for sharing this. Sandra my deepest condolences for the loss of your brother. He was clearly a creative and skilled painter, and I am thrilled to have seen his work in person. He made an indelible impression on Mr Labine, who has the good fortune of living with his work.